TIREE: An adult Ring-billed Gull today in with the Common Gulls at Sandaig (John Bowler). Yesterday 8 Snow Bunting at Gott Bay (Steph Cope). MID-ARGYLL: The Little Egret seen again at the Add Estuary this morning during WeBS count – also a flock of 310 Redwings near Barsloisnoch Farm (Jim Dickson). A male Blackcap was at Stonefield today (Anne Lavelle). Near Barsloisnoch 2 Greenland White-fronts have now appeared…nos less each year! (David Jardine). MULL: The Cattle Egret was still at the Calgary machair yesterday – also a Jack Snipe seen (David Jardine). KINTYRE: At the Kilmichael floods; 5 tundra Bean Geese in with 304 White-fronts, 150 Greylag and 49 feral Canada. Also, 241 Eurasian Wigeon and 45 Northern Lapwing there. (Eddie Maguire with Peter Nash / Nick Curtis). COWAL: A good WeBS count at the Holy Loch today with highlights of – 4 Goldeneye, 4 Little Grebe, 242 Oystercatcher, 8 Lapwing, 78 Curlew, 1 Greenshank and 60 Redshank (George Newall). 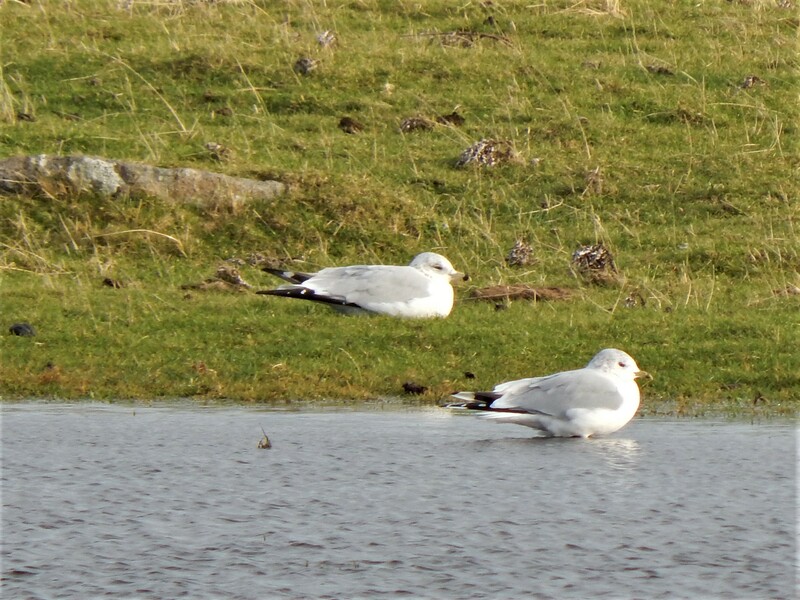 RING-BILLED GULL (left) – Sandaig, Tiree 11th Nov (John Bowler).